One of my big “growing up” milestones was when I bought my first small bottle of liquid foundation in I’m guessing 8th or 9th grade – at the drugstore, smiling, allowance money in hand. I’ve always been obsessed with that flawless skin you see on TV or in magazines and wanted to replicate that for myself. Looking back on it now that was probably a little much for a 14 year old but I admit, I was a wee bit obsessed. I consider wearing foundation as basic as brushing my teeth before heading out the door. And I do try to select formulas with SPF whenever possible. Before I go on, let me just say my ramblings are going to be about liquid foundations, not mineral. I did briefly dip my toe in the whole mineral foundation craze and ordered some free samples from everydayminerals.com. But after nearly 30 years of wearing various liquid foundations I just can’t make the switch. I tried, but I don’t have the patience for all the swirling and tapping required to get a mineral foundation sprinkled into the right sized small bowl or tray to mix and then apply. Plus I need to be careful to not let “powdery” products settle into the lines around my eyes and on my forehead. In one of my earlier posts I mentioned that I don’t necessarily believe the best products are the most expensive. But given foundation is pretty much a daily ritual in my book, it’s worth it to spend a little more on something that really works – and getting the right match done professionally at a department store counter. Just like a hair cut and/or color – we wear our face and our hair every day, so why not invest in it? So. Liquid foundation, if applied correctly, should help even out your skin tone without it looking like a can of paint hit you in the face. Yes, there’s a fine line there, ha ha. And ideally you should be able to just spot apply it where you need the most coverage…really it should just blend in with your skin texture and skin tone completely. Haven’t we all seen those unfortunate mistakes of a wrong color line at the jaw where someone’s foundation stops? UGH. So please, I implore you all out there…try on foundation in NATURAL LIGHT along your JAWLINE. Not on the back of your hand or your wrist – trust me, the skin on your hands is not the exact same shade as your face. Finding natural light can be hard if you’re deep in a department store or shopping mall. But it’s completely worth it to ask the Sales Associate (SA) for a small mirror so you can walk out to daylight and check it yourself (or use a small mirror in your purse). Might seem a tad silly but it’s your hard earned money and YOUR face so take the time to find a good match. Sadly, my “holy grail” foundation, Lancome Maqui Libre in a shade called Delicate Porcelain was discontinued many years ago. After 15 years – no joke – it was heartbreaking to see it go. Quite literally it was my go-to “jeans and a t-shirt” makeup. It worked for any occasion at any time and it never failed me. I remember when I first heard it was being discontinued I stocked up on quite a few spares, including some off the Lancome website and I stored them in the fridge. Since that era, I’ve journeyed off into quite a few different directions for sure. Revlon ColorStay SPF 15. I have the Normal to Dry skin formula. I’m of the school of thought to spend more on foundation (meaning, go to a department store or to a place like Sephora to get professionally matched), but I have heard great things about ColorStay so I tried it out, using a 30% off coupon at a nearby drugstore. I AM impressed…this stuff DOES stay put as its name implies. It’s a little harder to apply than the Estee Lauder – meaning, you’ve got to work quickly to blend it as it tends to “grab” to the skin pretty quickly. And it does require a little extra work to remove at night. No joke – this is one of my favorite “do a little makeup real quick” foundations to put on before I go play hockey. Again, to tone down those pesky, pink cheeks. Find it at drugstores. Cover Girl TruBlend. In trying to keep with my “try it in daylight” mantra, I took a package of this up to the window in the drugstore and held it up to my face with a mirror. Not the best way to test a foundation but given it was a drugstore (meaning, cheaper) brand I figured it wouldn’t be a huge waste if it didn’t work out. I like that it comes in a pump dispenser (the Revlon ColorStay does not), which means a longer lasting product in the longer run. This one does not have SPF but if I wear it over a moisturizer and/or a primer with SPF I don’t worry about that too much. It does tend to wear off and separate on my skin by late afternoon so granted it’s not my favorite of the bunch but I do find wearing it over that Chanel primer I talked about in my earlier post does make it stay on longer. At drugstores. Makeup For Ever HD foundation. No SPF, but it has a pump dispenser and goes on VERY nicely. This is one of the foundations I’d trust on a business trip, meaning it will look good and stay put in a variety of situations and climates. At Sephora. Makeup For Ever Liquid Lift foundation. This is on the far right of that row of foundations and probably looks worn out, gross and sad. It IS a great product but this formula has been discontinued and that bottle is on its last legs – not very camera-ready I’m afraid. I’ll keep using it till it’s gone or until it fails the “smell” test, ha ha. Oops! One got left out of the lineup here…yes, the shutter-shy foundation is MAC Studio Sculpt SPF 15. Once again, MAC’s foundations are nothing to jump up and down about. This one comes in a long tube and feels a little more gel-like than liquid. If you’re looking for a full coverage foundation it’s worth checking out. I tend to save this for special occasions such as a night out or when I feel like doing more dramatic makeup. The texture can be a little tricky and even in that “not warm” NW15 it’s still a little too yellow. It has a very nice light butterscotch scent, however! Department stores or maccosmetics.com. Ah, concealers. 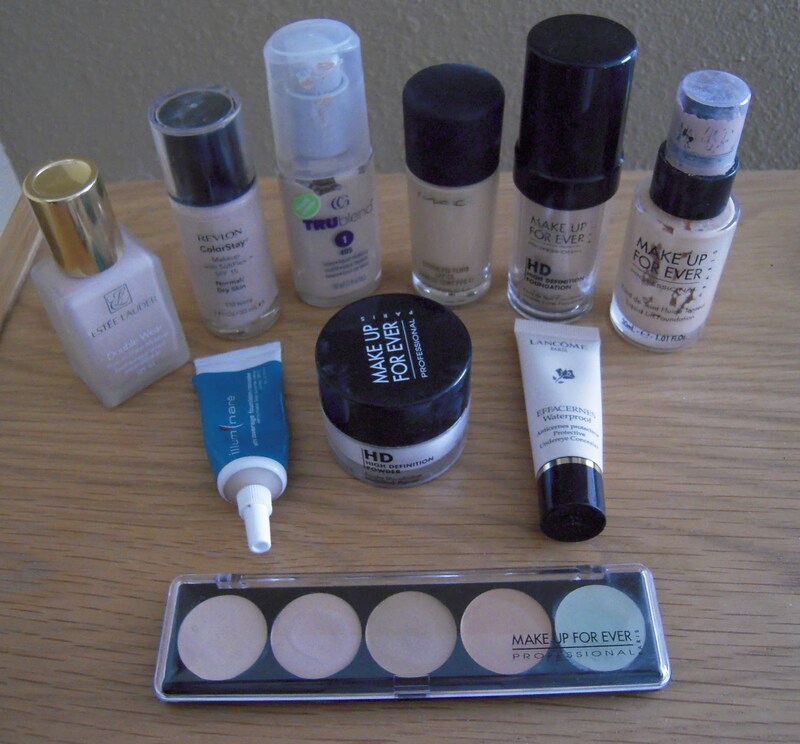 I’ve used them under foundation mostly to cover the dark circles under my eyes. Amazingly, since I started exercising more regularly I’ve found my dark circles aren’t quite as dark as they used to be! Coincidence? Who knows? Although I do have a lot of products in these posts, I am a believer in ‘less is more,’ so if a concealer isn’t necessary, then why bother? Lancome Effacernes waterproof undereye concealer. I discovered this before learning about Illuminare and I do like both equally. This one says it’s waterproof but to be honest I don’t need a concealer to outlast a swim or shower. For everyday wear, it’s excellent. Sephora or lancome.com. Makeup For Ever concealer palette. These come in a variety of color spectrums – this one is in “No. 1,” the lightest shades. Most are for dotting over undereye circles or other imperfections, while the light green on the far right is a color corrector for redness. The apricot shade just next to the green can also be used to correct undereye circles but I tend to stick with lighter shades in the products above. I don’t use this super often but it is a nice alternative and does blend in well with foundation without getting cakey. It’s at Sephora. And…lastly…loose powder! Where would I be without this stuff? As much as I love liquid foundation, I also love loose powder where it’s needed to set, such as on the eyelids and under the eyes. For years my favorite was Coty’s AirSpun loose face powder in the colorless, translucent shade. While it’s a great value and lasts, the problem I’ve had all these years it that it’s messy and hard to control. Plus it’s hard to pack/tape up for travel. Given that, my splurge/investment more recently is Makeup For Ever’s HD Loose Powder. It’s probably 3 times the price of Coty’s but the container design makes up for it. It’s sealed inside the lid with small holes like a salt or pepper shaker, so you can just shake what you need into the upper section as you go without worrying about a big mess or waste. It’s super fine and goes on great with a kabuki brush. Definitely worth every penny!